It's not always dry where you work. It can get wet and muddy wherever you go night or day. You don't want to spend your day being wet while you work. 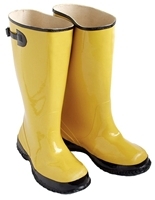 Our safety rubber boots will protect you when the rain falls down. We carry name brands like Tingley, Boss and others. Order a pair today and let us get it delivered directly to you fast. At Tingley, we believe “General Purpose” doesn’t have to mean an uncomfortable fit or poor performance. When you are working in wet, muddy conditions, our General Purpose PVC knee boots provide easy walking and all day protection. Ideal Applications: General purpose in Agriculture, Industry, Concrete Pouring, and Construction. 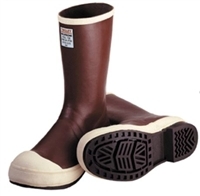 When you want to keep your little piggies nice and dry these Tingley rubber boots are just the thing. These are designed for the tough industrial workplace and will stand up in any environment. The multi-ply neoprene construction and steel shank will give you comfort while the chevron tread pattern keeps your grip on the floor. Keep your feet safe and order a pair at our everday low price. Safety-Loc Outsole: For slip resistance on wet-clean surfaces.